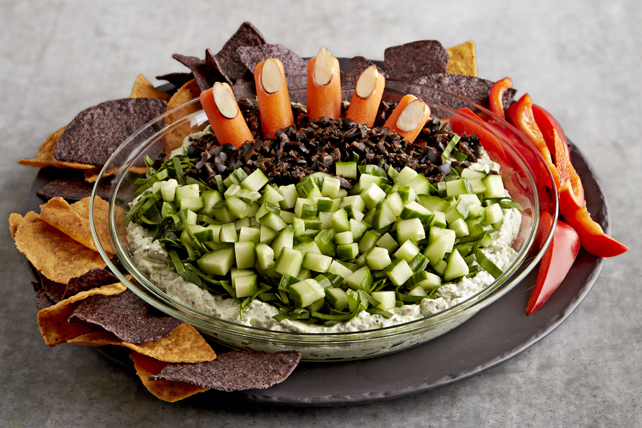 Need a show-stopper appetizer for your next Halloween party? Serve up our Creepy Halloween Pesto Dip for smiles all around. Use small amount of sour cream to attach 1 nut to end of each carrot to resemble fingernail; set aside. Chop 1 cup spinach; reserve for later use. Process remaining spinach, sour cream and nuts with cream cheese, pesto, lemon zest and juice in food processor until smooth; spread onto bottom of pie plate. Top with cucumbers and reserved chopped spinach. Insert carrots in dip to resemble fingers as shown in photo. Sprinkle with olives. Serve with pita chips. To make your own spooky pita chips, use Halloween-shaped cookie cutters to cut pita breads into shapes. Place in single layer on baking sheet. Bake in 375ºF oven 5 min. or until lightly toasted. This fun dip can be prepared ahead of time. Refrigerate up to 24 hours before serving.